ith the lifting of the Foot & Mouth restrictions in early June, the Centre soon became fully booked and slowly normality returned. 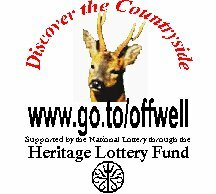 The chattering crocodiles of excited children once more wound their way down to the Centre through the heart of the village of Offwell. The absence of the usual cattle from the meadow entrance and the lack of walkers along the footpath, meant that our first group of reception children were virtually lost in the long grass and felt like intrepid explorers. Later in the season, the uncut meadow was a truly wonderful place of golden waving grasses, interspersed with wild flowers and alive with butterflies and grasshoppers, providing a wonderful introduction to a day at the Centre. also a wealth of information. This ranges from image libraries, to movies, sounds, charts, diagrams, quizzes and puzzles. Further plans include the development of a series of webquests which will tie in practical work carried out at the Centre with resources and information freely available on the Trust website and on CD. These webquests will involve researching topics from information provided on CD and on the internet, in order to carry out activities complementary to the hands on activities provided at the Centre. They will encourage the maximum educational value to be extracted from a visit to the Centre. The internet allows the Trust to spread its educational remit far and wide. A recent addition to the website of a series of images following tadpole development in real time, led to contact with a family in Wales, who were educating their children from home. As a result of following the tadpole development on line, they were inspired to come all the way to Devon to take advantage of the Centre.